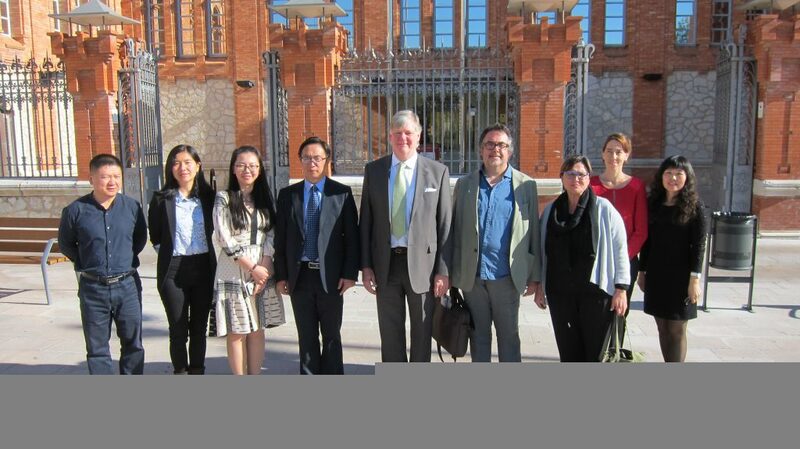 The Chinese delegation with representatives of the URV. Representatives of Yunnan University of Finance and Economics (YUFE) and the URV met on 25 October at the Office of the Rector to agree on the next steps in establishing a joint degree between both institutions. The new qualification will enable Chinese students to obtain a postgraduate qualification in Tourism from the URV to complement their three-year postgraduate degree programmes in Tourism from YUFE. The two universities are also studying ways for students from Yunnan to participate in the Master’s Degree in Tourism Destination Management offered by the URV’s Faculty of Tourism and Geography and, at the same time, to open up mobility opportunities for URV students to study on the Master’s Degree in Tourism taught in English at YUFE. Representing the URV at the meeting were the Vice-Rector for Internationalisation, John Style; the Vice-Rector for Academic Programming and Teaching, Domènec Puig; the Dean of the Faculty of Tourism and Geography, Marta Nel·lo, and the Department of Geography professor, Antonio Russo. YUFE was represented by the Vice-Dean of the School of Tourism and Hotel Management, Xie Hongzhong; the director of the Department of Cultural Industry Management, Yang Liu; the director of the Department of Economics and Management, Li Xuesong; and a professor from the Department of Tourism Management, Yin Ji. In addition to discussing the joint qualification, the two universities opened up the way for new collaborations in areas such as research, master’s and bachelor’s student exchanges, and the Study Abroad and Collaborative Online International Learning programmes. In 2017, the URV signed the initial agreement with YUFE, which has since enabled collaborations such as the joint organisation of an international symposium on Innovation in Cultural Tourism (in Kunming, 14-16 July 2017) and the design and preparation for tourists of the “Tea Horse Trail”, which links the Chinese province of Yunnan with Vietnam to the south-east and Tibet in the north-west.